If you have thought about getting out of your vehicle and can't seem to pay on your car note each month, then it's time to consider some of the other options. Refinancing and trading in your vehicle are two of the most common ways that owners get out of loans that are causing them issues. Refinancing means that you change the loan terms in order to get a lower payment each month. Sometimes this means that your loan terms are extended with the same or higher interest rate, while in other cases, you may see a lower interest rate. The other option is to go with trading in. This is where you may have some equity in your vehicle in which case your car dealership may buy back the vehicle and offer you a trade for another vehicle that is less than the vehicle you owe on. 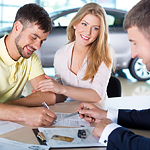 In some cases, if you are willing to pay a down payment, you may get into a nice vehicle with your equity. You can check out all of the options at McSweeney Automotive located in Talladega.